Curious to know the artist behind the professor? Here is your chance! The School of Art at the J. William Fulbright College of Arts and Science is pleased to present a faculty exhibition at the Walker Stone House May 12-26, 2018. Thanks to the partnership with Experience Fayetteville, the School of Art established a three-month spring residency agreement utilizing the historic Walker Stone House. The additional space provided new exhibition opportunities, arts entrepreneurship expansion and creative workshops. It has been six years since the art faculty came together in one exhibition. The School of Art faculty shows their work all over the country, but rarely has the opportunity to show locally. The additional space at the Walker Stone House has provided that opportunity. 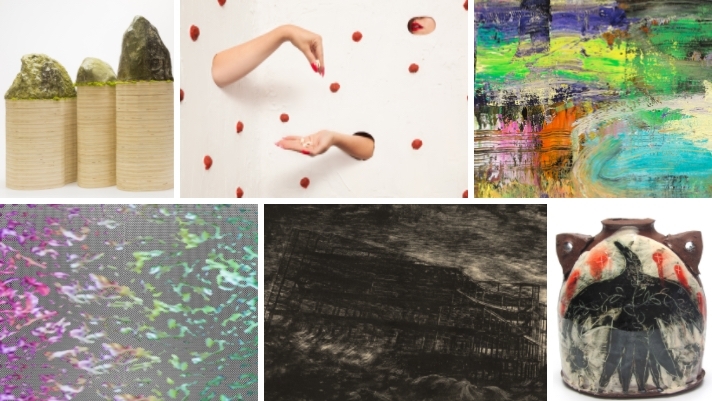 The exhibit will feature works in printmaking, design, ceramics, drawing, painting, photography and sculpture all created by the faculty who develop artists, designers and scholars within the School of Art. The community will be able to see first-hand how the School of Art educators are entrenched in their own practice as well as their teachings. The exhibition is free and open to the public every Saturday from 9 a.m. to 2 p.m. May 12-26, 2018. Opening reception will be from 10 a.m. to 2 p.m. Saturday, May 12.